The stories written by The Bullied explain the subtleties and agony of harassment, helping readers understand that there is more to unkind words and behavior than "just joking around." Although many of these teens have suffered through harassment by their peers, their essays are both empowering and inspiring. By exploring the essays by The Bullies, readers will discover that the bullies are often times incorrectly labled as bad kids, but many are simply trying to fit in, despite their own insecurities and fears. While these bullies may still have their own seemingly insurmountable obstacles at home, they share their experiences and insights hoping to manage and reforming other bullies. The section voiced by The Bystander shares tales of those who have regrettably watched and those who have stepped up to help others. Here, readers will find the inspiration to speak out rather than just standing by while others are emotionally harmed. Whether due to race, weight, or jealousy, there are a myriad of reasons WHY. Included in this startling compendium of personal stories that convey the complexity and nuances of what it means to be bullied, are stories of regret, promises, and encouragement that will help readers find solace during their teen years and show them how--as adults--their words and actions can provide strength and reassurance to others experiencing all aspects of bullying. Ultimately, they will learn to find their voices in order to break the cycle for good. "Bullying Under Attack is beyond eye-opening, beyond painful to read. That said, this book should become part of the school required reading." "This book is good for children and adults that have been bullied just to let them know that they are not on their own." "This book was really important and vital to me. I was extremely grateful for it, and I hope that many others read this and recognize the importance of stopping bullying, if they haven't yet. Even if you do realize it, you--like me--may want more information, the human quality in the world of bullying." "I think all teenagers, adults and teachers must read this book. This book should be part of the required reading material. I recommend this book to everyone, young and old." "This is a book that I would recommend to parents, tweens, teens, and educators. I will be purchasing this book for my own collection. And recommending to my students and peers." "What an incredibly heart-wrenching book." "This book is well put together and is a powerful look into the world of bullying and bullied and the cost of allowing bullying to continue in our communities." "It'll be a great resource on bullying & will be going on a brochure I'm passing out to schools about our bullying resources." "A useful and insightful text for victims and carers alike, to deal with a long underestimated problem. Should be stocked in all school libraries." "This book is a much-needed anthology. There are not a lot of books out there written by teens, for teens, about bullying--especially including the perspective of the bully and the bystander. I would recommend this book to really any teen that I know, whether they suffer from bullying or not. I would also recommend this book to anyone who works with teens for a living, such as youth pastors, high school teachers, therapists, etc. Overall, I am glad that I read it." "Bullying Under Attack should be required reading in schools everywhere. This should be the book discussed in English class, read during assemblies, carried in every backpack, and available on library shelves. This is an excellent book with the power to influence its readers and maybe, just maybe erase some of the hatred from this world." "I really wish a book like this had have been available when I was going through my years of torment. But I am happy that it is available now...I would highly recommend this book to everyone." "A timely and powerful book. I ordered copies for the library and hope that they will reach readers that can benefit from its message." "Certainly, this is the most important young adult and children's book I've read in my entire life." "This book is a must read for everyone, and is one that is currently being added to the library collection." "Wow. What a timely achievement--the only book about the problem of bullying entirely written by teenagers. I know their personal stories will move you, anger you, inspire you--even scare you. A great read for a great cause." "Heart-felt and heart-wrenching stories, straight from the experiences of the bullied, the bystanders, and those who have bullied. Exceptional writing from all, and so worth the read." "Bullying comes in many forms: name calling, shutting out, character assassination, humiliation . . . even getting spit at. All of which happened to me. This important book takes on an issue all of us can relate to because it happened to so many of us. It's refreshing and at times heartbreaking to hear the experiences of these young people. Their voices remind us that bullying is still an issue for children of all ages, and their stories bring a fresh perspective to an old story. Bullying Under Attack is a unique wakeup call for parents, teachers, and bullies, victims, and bystanders to stop, listen, and think about the power of their words and actions." "I was never a victim . . . never a bully . . . but bystander? Oh, yes. I was too often a bystander. Maybe I am, sometimes still. This meaningful book will kindle sparks of recognition in many of us, along with a reminder that we can change." "It's great that Teen Ink has given a wide array of teenagers a chance to speak out on bullying!" "Can there be any truer YA literature than that created by young adults themselves? These stories and poems about bullying are wrenchingly beautiful in their honesty and sometimes remarkable in their insight. I have to believe that they will serve as a welcome salve for the wounds and loneliness of those who are bullied as well as wake-up call for the bullies who so often cannot comprehend the pain they inflict." "People say that some books are mirrors and some are windows. That is to say, readers can find themselves reflected in the stories, or see out of their own narrow lives into a broader view. The stories in this collection will do this for you." "Without detracting from what experts understand about bullying, there is no substitute for direct testimony by victims, victimizers, and bystanders. In this unique collection, young people describe their own experiences vividly and, in the process, reveal what they have learned about others and about themselves." 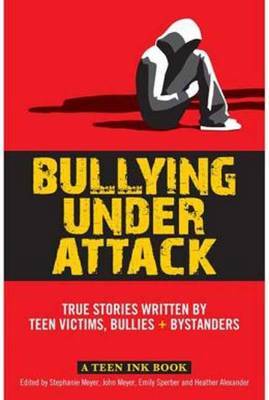 "Bullying Under Attack's gripping firsthand accounts take you inside bullying from every vantage point. Writing with honesty, clarity, and heart, these brave young people illuminate a topic society prefers to squint at. Inspiring." "With bullying on everyone's mind, this book offers great insight into the real-life stories of those most affected: the victim, the bystander, and the bully. A must-read for parents, educators, and teens who want to understand the severity of the bully crisis." "For almost a quarter of a century, Teen Ink has been encouraging young people to write and then has published those pieces. These heartfelt essays and poems explore the issues faced by teenagers today. I applaud their efforts because they not only help young people deal with their own lives but also encourage the budding authors of the next generation."